Some of this is the result of what some conservative commentators have called Bush Derangement Syndrome (BDS), an intense and irrational hatred of President Bush leading people to believe anything that casts the President in a negative light. BDS is closely related to Clinton Derangement Syndrome, which brought forth "theories" about how the federal government was involved in the Oklahoma City bombing on April 19, 1995. Without getting into a discussion of the evidence and documentation presented by the "9/11 Truth" crowd, let's examine for a moment the basic premise of the movement. The President of the United States (or someone at a high level in the administration) intentionally murdered 3,000 people, destroyed the World Trade Center, severely damaged the Pentagon, and crashed four commercial airlines in order to start two wars with Iraq and Afghanistan. I understand that any President will have critics and those who will vehemently oppose him. I understand that any President will have people who believe his motives are less than honorable in the policies he advocates and positions he takes. I was very critical of the previous President and I believe his tenure was very destructive for our country. I have often referred to the former occupant of the White House as "disgraced ex-President Clinton." As immoral as I think Clinton was, though, I do not believe that he was part of a conspiracy to blow up a federal building in Oklahoma City. Do the people who believe these 9/11 conspiracy theories truly believe that the President of the United States is so evil that he would be part of the worst terrorist attack ever committed on American soil? 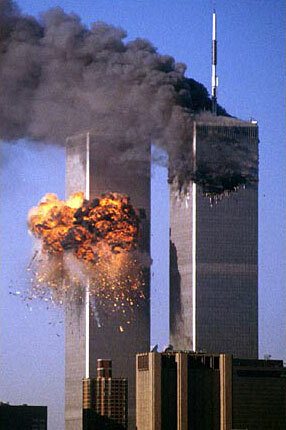 In order to believe that President Bush was involved in taking down the towers, you have to believe one of two things: that the President planned the terrorist attacks with Osama bin Laden, or that the President knew about the attacks in advance and planned to opportunistically destroy the WTC when Al Qaeda struck on September 11. In order to believe that the President was involved in September 11, you further have to believe that the administration has somehow managed to hold together a large conspiracy theory for the past six years, with no one accidentally spilling the beans or blowing the whistle. Could a conspiracy as large and complicated as would be required to pull off a planned demolition of the World Trade Center manage to hold together without leaks for this long? Could a federal government that could not competently get aid to New Orleans after Hurricane Katrina (to say nothing of other examples of federal incompetence) somehow hold it together in this case? And for what purpose would the President engage in such a monstrous act? A woman at the Buskirk-Chumley presentation told the H-T that "Somebody is getting rich off this war at the expense of many lives". Does she truly believe that the President of the United States would participate in mass murder in order to help supporters, campaign contributors or friends "get rich"? Even if we accept the premise that the President wanted a pretext for war, isn't there a much less complicated and less risky way to do it? Why not simply allow the terrorists to strike, instead of actively aiding them with a "controlled demolition"? Any major event like September 11 will be a source of controversy. The fact that we allowed 19 men with box cutters to use our transportation infrastructure to commit this atrocity strikes deep into our sense of security and, to some extent, our national pride. There certainly could have been more done to prevent the attacks in the years leading up to it. But it was not a wild conspiracy, it was an act of terrorism that showed how dangerous Muslim fanatics can be. I am thankful for the presentation on Monday night, because it showed how great this country is. We had people suggesting that the President of the United States committed mass murder of American civilians and aided a sworn enemy's attack on us. We had people suggesting that the President of the United States committed treason both in levying war against our country and providing aid and comfort to our enemies. Would citizens of many other countries have this freedom?